Opportunity is king in the NFL, and there’s nothing better than when opportunity meets efficiency. That’s the puzzle this article seems to solve each and every week. As usual, this article will seek out players who have been making the most of their opportunities, and opponents who have been giving up a ton of fantasy points per opportunity. PPO is a fantastic stat to use for identifying potential blowup spots for fantasy players. Below some players that are prime to break out in Week 13, according to the PPO data. Alex Collins is in a good spot against the Lions this week. Detroit has given up the fourth-most fantasy PPO to opposing backs on the ground. Collins has been efficient in his own right, gaining an impressive 4.9 YPC en route to the 18th-most individual PPO this year through 12 weeks. You have to like Dion Lewis this week against a Bills squad that has given up the most PPO to opposing running backs on the ground this year. Lewis, meanwhile, ranks eighth among all running backs who have at least 10 rushing attempts this year in terms of individual PPO. It’s tempting fate a bit, but Devontae Booker and C.J. Anderson of the Denver Broncos have a good matchup against the Miami Dolphins this week. Miami has given up the third-most fantasy PPO to opposing running backs on the ground this year. Of the two, Booker has been trending in the right direction and has received some goal line work in recent weeks. Kenyan Drake should see most of the work for the Dolphins out of the backfield this week, and while it’s a tough matchup against Denver on the ground (seventh-fewest PPO given up on rushing attempts), it’s a great matchup through the air (fourth-most PPO given up to opposing backs via the pass). Drake ran a season-high 29 pass routes last week after setting his previous season high (22) back in Week 9 and again (28) in Week 11. He’s trending up in that arena. Julio Jones had the fun last week, and now it’s Davante Adams’ turn to light up the Buccaneers passing defense, which still ranks last in PPO given up to opposing receivers (and it’s not even close). Adams ranks 20th among wideouts in terms of individual PPO, and his seven receiving touchdowns are tied for fourth-most in the NFL. This could be Mike Evans’ biggest game of the year. He draws the Packers secondary, which has given up the second-most PPO to enemy receivers this year. Evans only ranks 37th in individual PPO, but he’s proven enough times throughout his career that his celling is as high as anyone’s. Don’t be surprised if he reaches that ceiling this week. I like this spot for Rishard Matthews against the Texans, who have given up the third-most fantasy PPO to opposing receivers on the year. If Matthews sits (he didn’t practice Wednesday), then things open up for Corey Davis to have his first breakout game of the year (and of his career). Don’t sleep on Ted Ginn this week. He has a great individual WR-CB matchup, and the Panthers — a former team of his, if you’re into the Revenge Game narrative — have given up the eighth-most fantasy PPO to opposing receivers on the year. Ginn has gained a truly elite 2.13 yards-per-route-run average this year, just behind his teammate Michael Thomas (2.2). It’s a good enough mark to rank top-10 in the NFL. Hunter Henry gets the Browns, who have given up the most fantasy PPO to opposing tight ends this year. Henry ranks eighth among tight ends in individual PPO this year — wedged in between Rob Gronkowski and Travis Kelce. Not bad company. Delanie Walker caught his first touchdown of the year last week, and he should be able to keep things rolling in Week 13 against the Texans, who have given up the eighth-most fantasy PPO to the position this year. Walker’s 53 receptions and 613 yards both rank in the top four among tight ends this year. Don’t be afraid to use Zach Ertz this week just because he’s going up against Seattle. 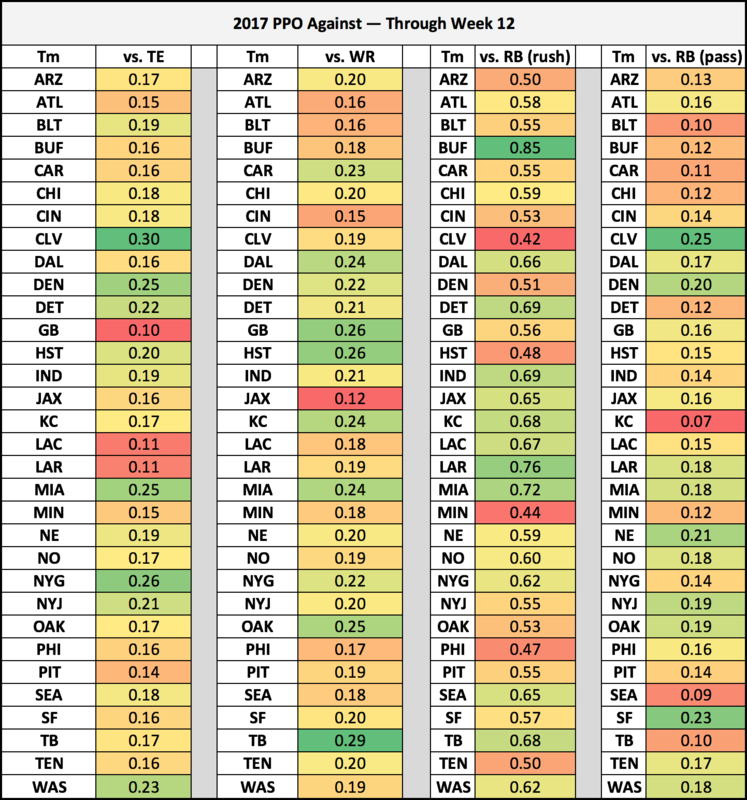 The Seahawks rank in the bottom-half of the NFL in terms of PPO given up to tight ends (12th-most), and Ertz ranks fifth-best in individual PPO at the position. Is it a Ben Watson week? He’s not a slam dunk, but he should be good for about 25-30 pass routes run against the Lions, who have given up the sixth-most fantasy PPO to opposing tight ends on the year.